Looking for superior osmosis and water filtration system for your home? A good choice is the iSpring RCC7. The WQA Certified Reverse Osmosis 5-Stage 75GPD Under-Sink Water Filter is a gold seal certified product which comes with a solid construction and superior performance to remove up to 99 percent of thousands of pollutants be it fluoride, arsenic, lead, or chlorine. This ensures that you are able to get a water filter that is able to take care of you and your loved ones’ health. What’s in store? The product weighs 25 pounds making it extremely lightweight and has product dimensions to be 15 x 8 x 18 inches. It does not require any batteries to work and is made of superior-quality materials. This is an extremely popular water filter with a 5-stage RO system that comes with a nickel faucet and see-through housing. The first stage involves a 5-micron high-capacity polypropylene sediment filter which is held in a clear housing. The second stage consists of a GAC carbon filter while the third stage consists of a CTO carbon filter. The fourth stage has a high rejection 75GPD TFC reverse osmosis membrane while the fifth and last stage involves a total polishing inline carbon. All the products are NSF certified. As water passes through this 5-micron sediment filter, all the dust, silt and rust gets removed completely, making the water tastier and healthier than before. The appearance of water changes when impurities is present in it and this water filter system offers clear water with every use. Added benefits are that the water system does not get clogged anymore as the water flowing through it is pure and clean. 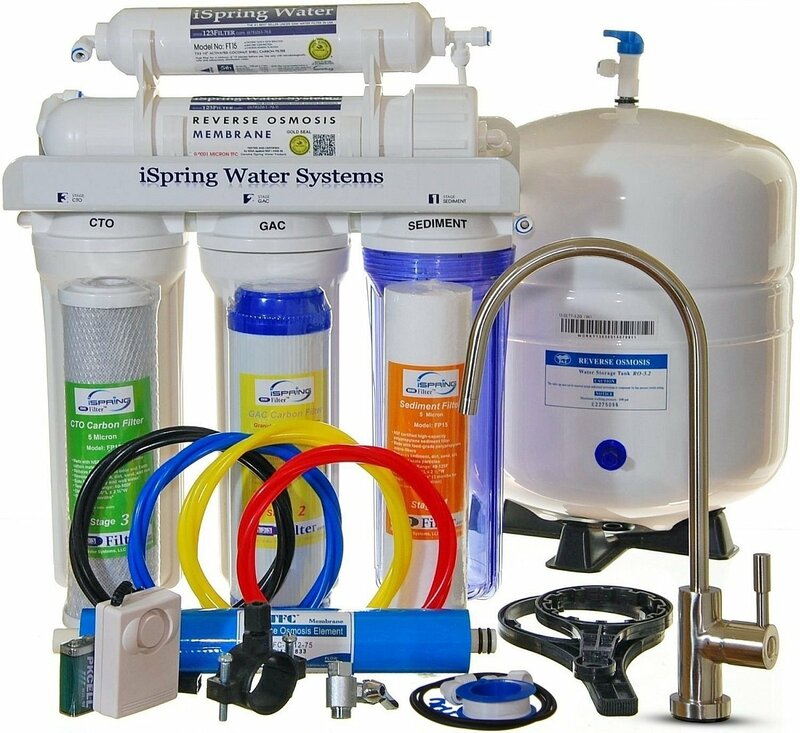 iSpring is considered to be a legendary brand in itself and boasts of a real and high-quality RO system which ensures safe water, good health and reasonable pricing. The cartridge set which consists of a gradient sediment filter, 0.0001 micron RO membrane and a fine coconut carbon are all guaranteed to be extremely durable and cost less as compared to other similar sets available in the market. All the products and parts in this system are independently tested and certified against NSF standards for use of FDA and RO. The manufacturer offers a 30-day money back and a one-year satisfaction guarantee. Being reasonably priced and also available for a discount in online stores, this water filter system has proven to be extremely affordable and has become popular among several families. Its ease-of-use and installation allows an individual to take care of it all himself with a little bit of plumbing skills. The entire installation is available on a YouTube video guiding the new user on everything. The brushed nickel faucet included in the package helps to save a good amount of money. With the system running quietly and consistently, you do not have to worry about extra noise in your kitchen. Since using this system, we have noticed that we are now getting cleaner, healthier and tastier water with every use. The company offers only a one-year satisfaction guarantee though several other water filter systems come with a 2 to 3-year-old guarantee. We also noted that the faucet that comes along for dispensing water has a small base and tube. This can be a problem as the flow of the drip can be slow. Despite these issues, it should work well for years to come. 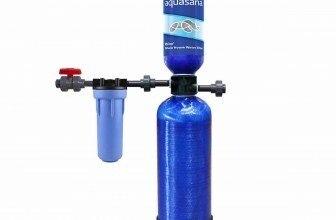 For the price it commands, this is one of the best reverse osmosis water filters out there for you today. The water filter is undoubtedly one of the best reverse osmosis water filter system in recent times and is perfect for families of all sizes. The cartridge sets do not cost much so you dont have to worry about high replacement costs. 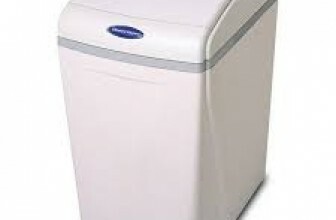 The iSpring RCC7 has been proven to give pure, healthy and tasty water and a hassle-free operation making it a top choice for people looking for solutions related to water-problems. It is reasonably priced and comes with several extra and add-on parts which make it all the more worthy and valuable. 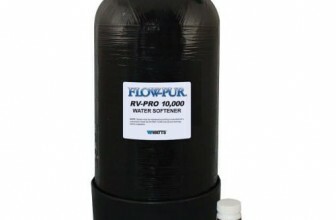 Only need a small water softener for your family of 4? The WaterBoss 220 may be what you’re looking for. Read our review here!